Velodyne WiConnect-10 review | What Hi-Fi? We’re not averse to wires: it comes with the territory. But some can’t tolerate the sight of a cable, and it’s these buyers Velodyne is after with its WiConnect-10. This uses a compact 2.4GHz transmitter module able to transmit bass at ranges of up to 15 metres. Simply connect your AV amp’s subwoofer preout into the transmitter using a short RCA phono interconnect, power the system on and it will form the necessary wireless association with the subwoofer itself. Four selectable channels are provided to ensure an interference-free signal. 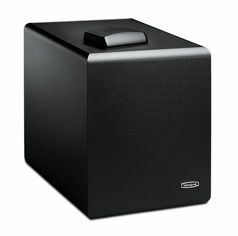 The subwoofer itself is more prosaic: it’s a downward-firing 25cm design with 100W of Class D amplification and a substantial rear-facing port: a reasonable specification, but nothing special by class standards. And unfortunately, that’s precisely how the Velodyne sounds, too. Sure, it works, and comparisons with a conventional wired connection revealed little obvious penalty in opting for wireless transmission. However, there’s a plodding, leaden character to the bass that saps the life from both fast-paced music and action-movie soundtracks. Velodyne’s own CHT-8Q is a more enjoyable listen, and cheaper too: it may be reliant on a wired link, but for us, that’s a compromise we’d cope with.